Is Pinterest Good Enough For The Growth-Crazed IPO Market? (Bloomberg Opinion) -- I could only ask this question in the late stages of a decade-long stock market expansion: Is it good enough to grow at 60 percent a year? Pinterest Inc., the online scrapbook, on Friday released a pitch to potential investors in its initial public offering. The document revealed a company with about $756 million in revenue from online advertisements in 2018, a 60 percent growth rate that accelerated a bit from the previous year, an operating loss that is not outlandish by the standards of tech firms going public and about 265 million people who use Pinterest at least once a month. This is a solid business, and better than I expected. Pinterest has clearly spent the last year focused on squeezing more money on average from each of its users and bringing down costs for things like its computer services contracted from Amazon.com Inc.’s cloud-computing division. The company even posted a tidy operating profit in the fourth quarter, which is weird to see from a tech company going public these days. Under normal circumstances, this kind of company would be a must-have for investors hunting for fast-growing assets. These are not normal times, however. Pinterest’s IPO — the timing of which seems to have been accelerated to capitalize on the hot U.S. stock market — will be a test of how much is good enough for growth-mad investors. Will they be eager to own shares of a consumer internet company that grew “only” 60 percent last year? We’re about to see whether growth and buzz matter in 2019 at the expense of any other quality. The answer will come when Pinterest sets the share price for its IPO after a few years in which the company’s stock value in private transactions has not increased much, if at all. In its last large sale of stock in 2017, Pinterest was valued at about $12 billion. 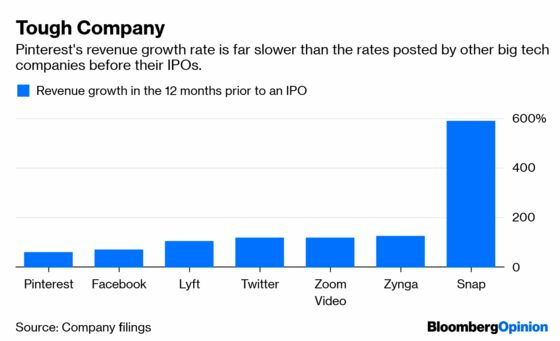 If it doesn’t seek much of a bump in valuation as it goes public, that would signal the company and its advisers are being careful not to ask too high a price for its not-outlandish growth rate. Facebook Inc. and Twitter Inc. were valued at about 25 times their revenue in the 12 months prior to their stock offerings, and Snapchat was about 50 times. If Pinterest goes public at a $12 billion valuation, that would be about 16 times trailing revenue. All those companies, however, were growing significantly faster than Pinterest is. Facebook’s revenue in the year before its 2012 IPO was nearly six times larger than Pinterest’s 2018 revenue, yet Facebook’s growth rate was 70 percent compared with Pinterest’s 60 percent. Pinterest is also in an odd position in what appears to be the beginning of a year of high-profile technology companies rushing for the IPO door. Pinterest isn’t as scorching hot a commodity as, say, Uber Technologies Inc. or Lyft. And unlike Snapchat and its legions of teen and twentysomething fans, Pinterest’s main users are women in their 30s or older. The company also tries to avoid the limelight for itself and operate like a normal, professional company rather than the typical Silicon Valley attention-seeking startup. Thank goodness. But the downside of less heat is the possibility of cooler demand from investors. The online clothing retailer Stitch Fix had some of this problem, too, in its wobbly 2017 initial public offering, although its stock price has nearly doubled since the company’s inauspicious market debut. Pinterest has a proven business model of online advertising, although that also means it’s a relative minnow fighting for ad dollars with sharks such as Google and Facebook. But Pinterest has solid revenue, fast growth by any standards other than the growth-rigged current crop of tech startups, and the profit-and-loss statement to stand on its own feet financially. Pinterest is a real company. But strangely, that may not be what growth-hungry IPO investors want right now.